As much as we're aware of the short term challenges of parenting a newborn, Jonathan and I are constantly considering what will come after that. After the incessant diapering, the breastfeeding, the sleep training and failures and subsequent exhaustion, the just-barely-managing-to-maintain-sanity-after-four-straight-hours-of-screaming, etc. We can't practice any of that stuff. It's just going to come. If we have the stamina, and if we remember to rely on and support one another, I have a feeling that, given our basic competency in life, we'll survive that stage. All three of us. From there, the questions become bigger. More philosophical. More nuanced. What can we do to make her a compassionate person? How can we teach her to respect the natural world? What should our reaction be the first time she lies to us? Which manners are most important, and how much stress should be put on her to learn them fast and follow them? Can ambition and self-motivation be taught without also damaging her psyche? Must we allow her to make our mistakes all over again for herself? Yes, I know it's impossible to answer many of these questions. But I love that we're asking them now. Jonathan has the mind of a philosopher, as well as of an engineer. Hearing him devote time and energy to the prospect of fatherhood warms me all the way to my toes. My cup runneth over. To be the father of growing daughters is to understand something of what Yeats evokes with his imperishable phrase 'terrible beauty.' Nothing can make one so happily exhilarated or so frightened: it's a solid lesson in the limitations of self to realize that your heart is running around inside someone else's body. I know my husband's heart better than anyone. He chose me to be its keeper for the rest of our lives, and I continue to be honored by that choice. Knowing that there soon will come another human who has an absolute claim to his heart, too, is a little scary. His heart has always been safe with me. I hope it will always be safe with her. 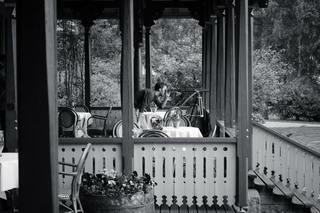 Photo: Last summer, we visited Telemark with some friends. On the back terrace of the famous timbered Dalen Hotel , after a round of aquavit, we found an antique spyglass, which made Jonathan's whole day.